The Land-Atmosphere Feedback Experiment (LAFE) will deploy several state-of-the-art scanning lidar and remote sensing systems to the ARM Climate Research Facility Southern Great Plains Megasite (SGP). These instruments will augment the ARM instrument suite to collect a data set for studying feedback processes between the land surface and the atmosphere. The novel synergy of remote sensing systems will be applied for simultaneous measurements of land-surface fluxes as well as horizontal and vertical transport processes in the atmospheric convective boundary layer (CBL). The impact of spatial inhomogeneities of the soil-vegetation continuum on land surface atmosphere (LSA) feedback will be studied using the scanning capability of the instrumentation. The time period of the observations will be August 2017. The SGP water vapor and temperature Raman lidar (SRL), the SGP Doppler lidar (SDL), and the National Center for Atmospheric Research water vapor differential absorption lidar mainly in vertical staring modes to measure mean profiles and gradients of moisture, temperature, and horizontal wind. The SRL and the SDL will also measure profiles of higher-order turbulent moments in the water vapor and wind fields, and profiles of the latent heat flux. A novel scanning lidar system synergy consisting of the National Oceanic and Atmospheric Administration high-resolution Doppler lidar, the University of Hohenheim (UHOH) water vapor differential absorption lidar, and the UHOH temperature rotational Raman lidar. These systems will perform coordinated range-height indicator (RHI) scans from just above the canopy level to the lower troposphere including the interfacial layer of the CBL. 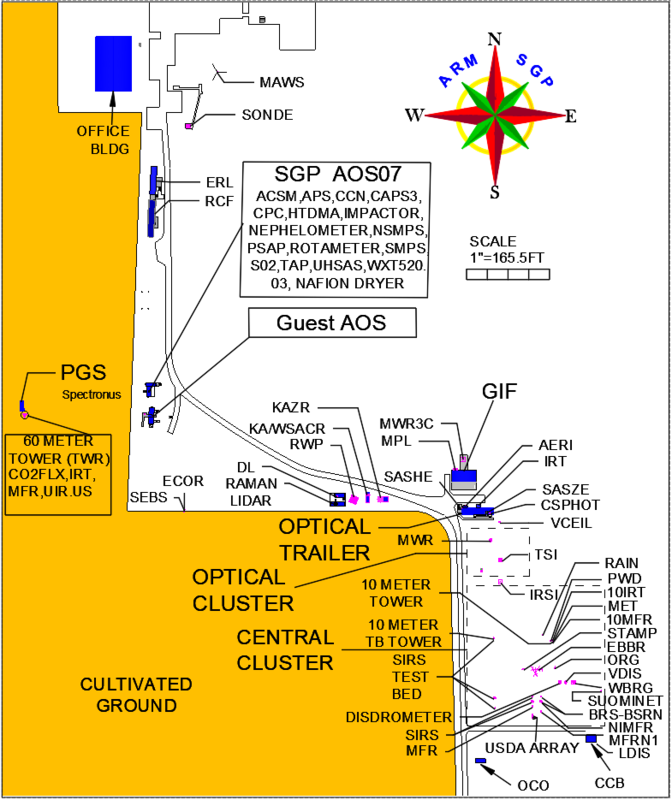 The optimal azimuth is to the ENE of the SGP Central Facility, which takes advantage of changes in the surface elevation and different crop types that are planted along that path. The University of Wisconsin SPARC and the University of Oklahoma CLAMPS systems operating two vertically pointing atmospheric emitted radiance interferometers and two Doppler lidar systems scanning cross track to the central RHI for determining the surface friction velocity and the horizontal variability of temperature, moisture, and wind. The variability of surface fluxes as well as CBL dynamics and thermodynamics over the SGP site will be studied for the first time. The combination of these three components will enable researchers to estimate the divergence of the latent heat profile and the advection of moisture. Thus, the moisture budget in the SGP domain can be studied. The simultaneous measurements of surface and entrainment fluxes, as well as the daily cycle of the CBL thermodynamic state, will provide a unique data set for characterizing LSA interaction in dependence of large-scale and local conditions such as soil moisture and vegetation state. The measurements will also be applied for the development of improved parameterizations of surface fluxes and turbulence in the CBL. The latter is possible because mean profiles, gradients, higher-order moments, and fluxes are measured simultaneously. The results will be used for verifying simulations of LSA feedback in large-eddy simulation and mesoscale models, which are planned for the SGP site. Due to the strong connection between the pre-convective state of the CBL and the formation of clouds and precipitation, this new generation of experiments will strongly contribute to the improvement of their representation in weather, climate, and earth system models. Mather J. 2018. 2017 Annual Report. Ed. by Rolanda Jundt, ARM Climate Research Facility. DOE/SC-ARM-17-038. Wolfmeyer V and D Turner. 2018. Land-Atmosphere Feedback Experiment Field Campaign Report. Ed. by Robert Stafford, ARM Climate Research Facility. DOE/SC-ARM-18-007. Meyers T, TR Lee, CB Baker, M Buban, and E Dumas. 2018. NOAA Air Resources Laboratory Atmospheric Turbulence and Diffusion Division Contribution to LAFE Field Campaign Report. Ed. by Robert Stafford, ARM Climate Research Facility. DOE/SC-ARM-18-011. Turner D, V Wulfmeyer, A Behrendt, T Bonin, A Choukulkar, R Newsom, W Brewer, and D Cook. 2018. "Response of the Land-Atmosphere System Over North-Central Oklahoma During the 2017 Eclipse." Geophysical Research Letters, 45(3), 10.1002/2017GL076908. Wulfmeyer V, D Turner, B Baker, R Banta, A Behrendt, T Bonin, W Brewer, M Buban, A Choukulkar, E Dumas, R Hardesty, T Heus, J Ingwersen, D Lange, T Lee, S Metzendorf, S Muppa, T Meyers, R Newsom, M Osman, S Raasch, J Santanello, C Senff, F Späth, T Wagner, and T Weckwerth. 2018. "A New Research Approach for Observing and Characterizing Land-Atmosphere Feedback." Bulletin of the American Meteorological Society, 99(8), 10.1175/BAMS-D-17-0009.1. Santanello J, P Dirmeyer, C Ferguson, K Findell, A Tawfik, A Berg, M Ek, P Gentine, B Guillod, C van Heerwaarden, J Roundy, and V Wulfmeyer. 2017. "Land-Atmosphere Interactions: The LoCo Perspective." Bulletin of the American Meteorological Society, 99(6), 10.1175/BAMS-D-17-0001.1. Goss H. 2017. Land-Atmosphere Feedback Experiment (LAFE) Backgrounder. Ed. by Rolanda Jundt, ARM Research Facility. DOE/SC-ARM-17-016.